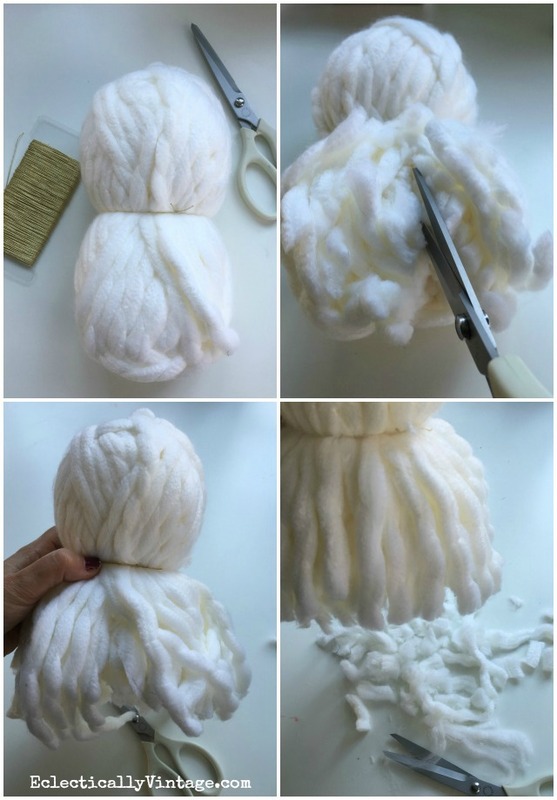 Pretty Packages – DIY Giant Pom Poms & 12 Creative Gift Wrap Ideas! Now that I’ve finished decking my halls for my Christmas house tour – check it out here, it’s time to wrap the presents! 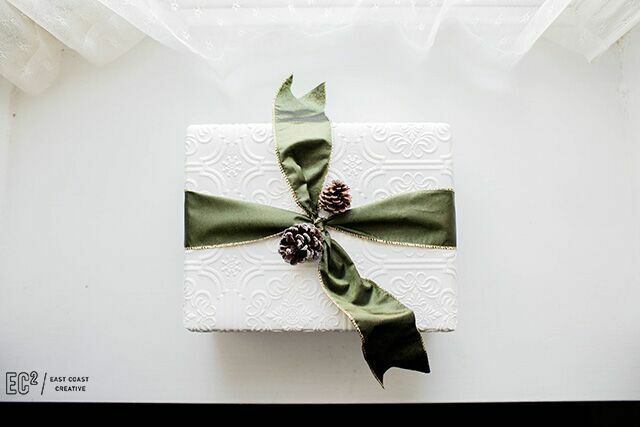 My friend Stephanie loves a creatively wrapped gift as much as I do so she’s gathered up a sleigh full of friends and asked us to create festive gift wrapping ideas. 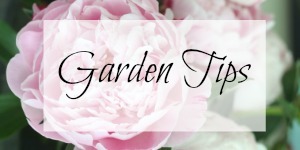 You can see all dozen creative ideas at Brooklyn Limestone and I’m sharing a few of my favorites at the end of this post. Sit down for a story about two sisters. One was gift wrapping challenged and the other was the Edward Scissorhands of wrapping. When we were kids, my sister (the gift wrapping challenged one) made me (Edward Scissorhands) wrap the gift she was giving to me! She would stand guard over my shoulder to ensure I didn’t peek inside the box as I covered it in flourishes, bows and curled ribbons to within an inch of it’s life. My love for making the package as thoughtful as the gift itself has not diminished. 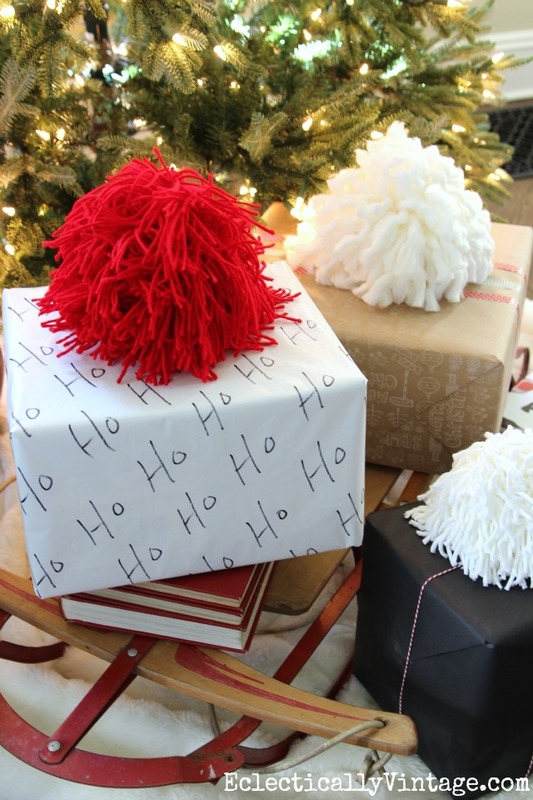 Although I was never a cheerleader, I do love me some pom poms (remember how I made pom pom flowers with a fork)? But not just any pom pom will do. These are the mother of all pom poms and they remind me of giant snowballs – the perfect gift topper for all of those special packages. 9) Give to your favorite person in the whole world! P.S. I love coordinating my gift wrap. 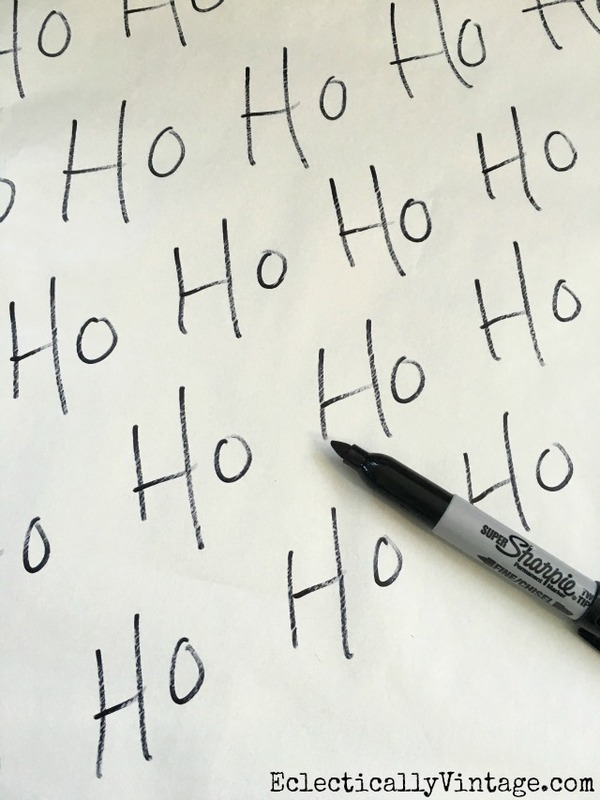 Cut wrapping paper to size and write on it with a Sharpie – Ho Ho Ho! 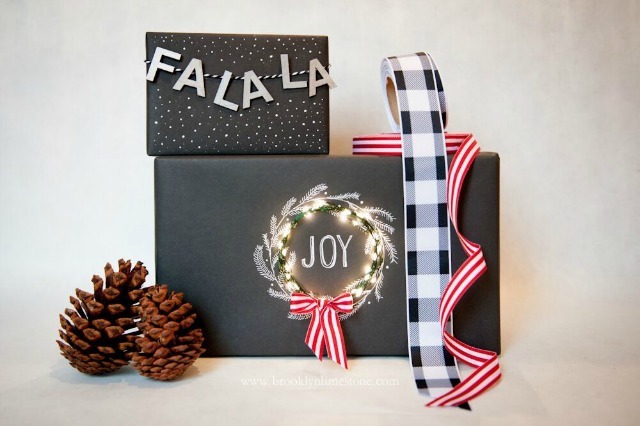 Get creative with bakers twine and washi tape. Add a cute car pillow and cozy throw so you can sit by the fire and admire your work. P.S. need gifts to go inside those boxes? 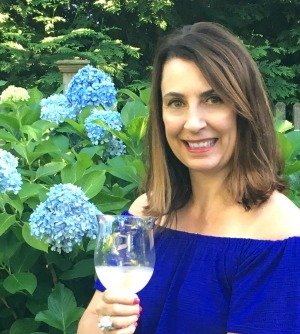 These are some of my favorite gifts to give to the girl/young lady (or even mom) in your life – HERE. 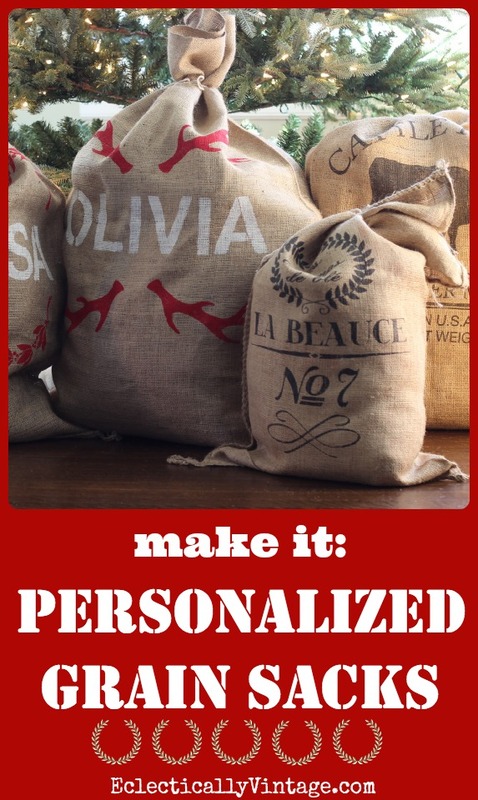 Another fun gift wrap idea are my DIY personalized grain sacks. Brooklyn Limestone gift lights up! 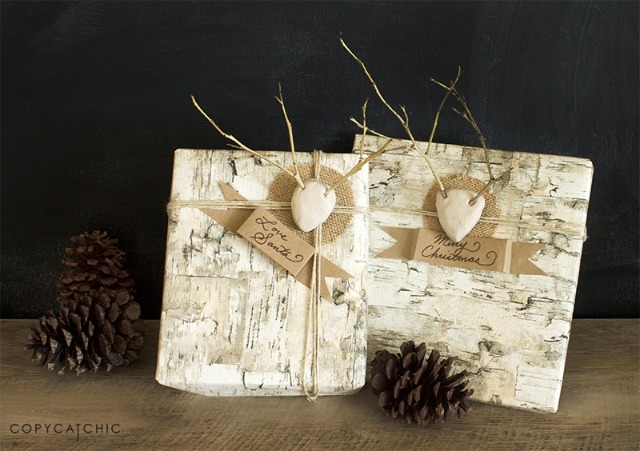 Copycat Chic made the cutest little clay reindeer gift tags complete with twig antlers! 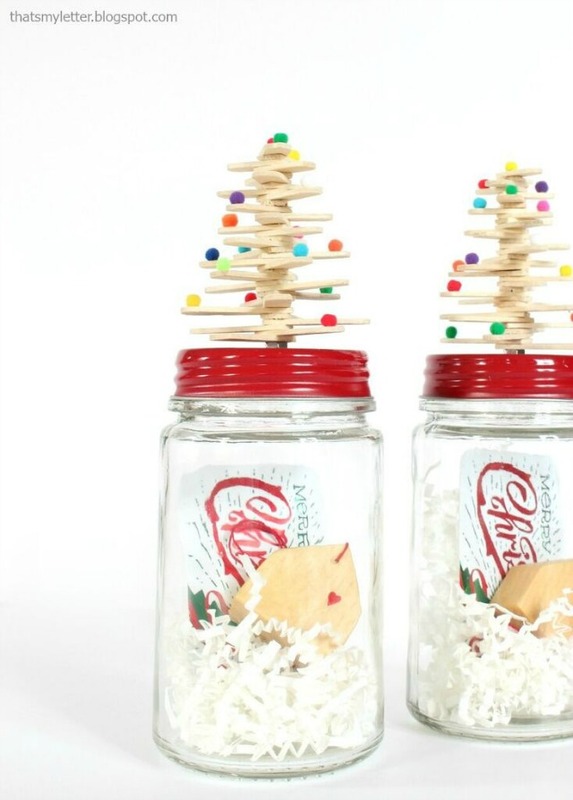 That’s My Letter gives her gifts in a jar complete with cute little wooden Christmas tree on top. Wallpaper as gift wrap! A fun idea from East Coast Creative. Great ideas, Kelly! Love getting creative with gift wrap… have a wonderful day! At least my sister doesn’t make me wrap for her anymore. Maybe that’s why my gift often comes in a bag! Thanks so much for joining. Your pom poms are powerful! I can’t seem to make them look like anything but cousin it but I can marvel at your perfect poofs! Merry Christmas! If you can’t do it, I’m sure your daughter can! Thanks for inviting me to be part of this fun idea! 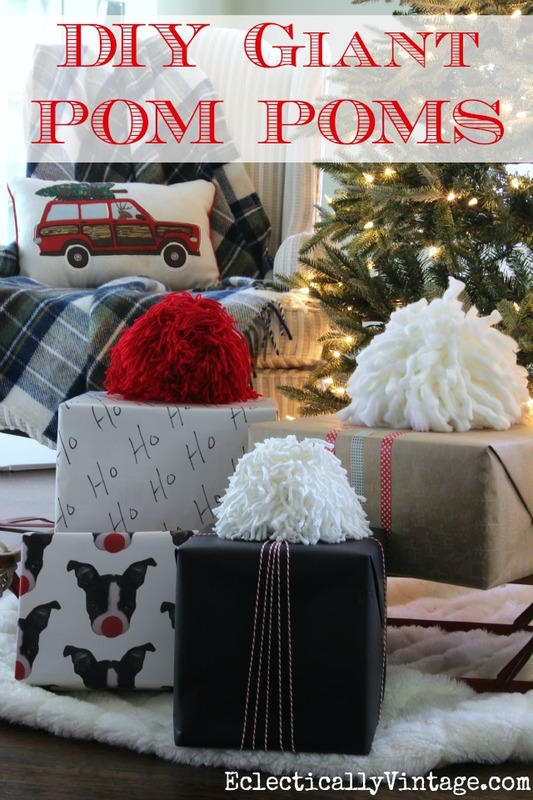 Love Love Love the pom poms! Thanks Lisa – they are so fun! 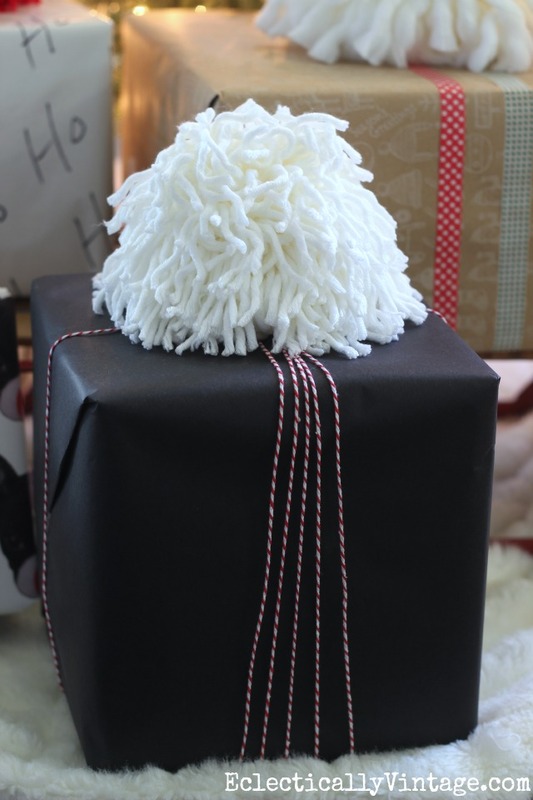 I love all your gift wrap ideas,just my style and those pom poms are precious,thanks for all those instructions you’re great.